Please do not ask how many jars I keep in my pantry, as it is more than would probably be considered normal for one person. I will never quit it. Are you with me on this?! If so, this is the dessert/snack/breakfast (😏) for you. It’s an unfussy but dazzling cake that tastes of sesame and cardamom, is as good on the second day as it is on the first, and pairs equally well with both coffee & tea. First, prepare an 8 1/2 x 4 1/2-inch loaf pan. Coat with nonstick spray, line with a strip of parchment paper (leave overhang on the long sides to help remove the loaf from the pan later), and then coat the parchment in nonstick spray as well. Sprinkle a light layer of black and white sesame seeds and sugar all over the inside of the pan. Set aside. Preheat oven to 350 degrees. In a spice mill or a clean coffee grinder, finely grind 2 tablespoons of black sesame seeds and set aside. In a medium bowl, whisk together flour, baking powder, salt, cardamom, and baking soda. In a small bowl, whisk together yogurt and tahini until smooth. In a large bowl, beat 1 cup of sugar, eggs, and vanilla on medium-high speed for about 2 minutes with a handheld mixer (or a stand mixer with the paddle attachment), until the mixture is pale and thick. With the mixer on medium speed, slowly stream in the oils. Add one-third of the flour mixture and mix on low speed until fully combine. Add half of the yogurt mixture and mix on low speed until fully combined. Repeat with the remaining flour and yogurt, ending with the flour. Transfer half of the batter back into the dry ingredients bowl and mix in the ground black sesame seeds. Dollop large spoonfuls of both batters into the pan, staggering the colors. 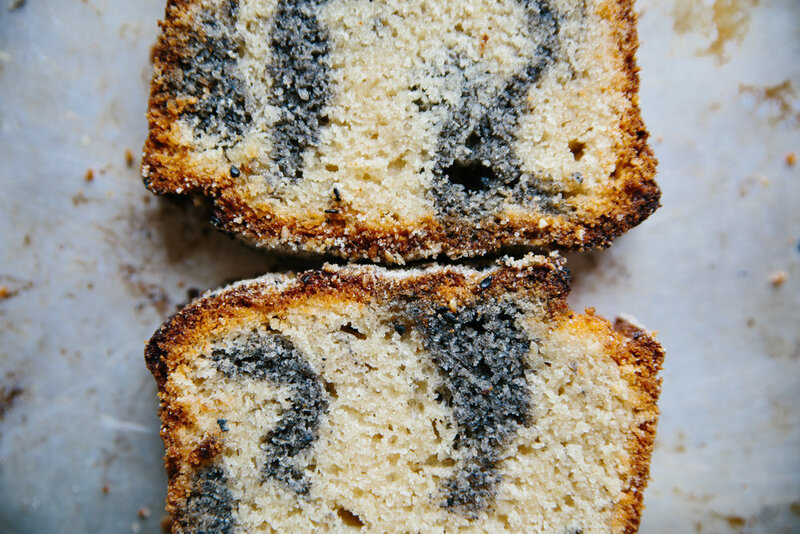 Use a skewer to swirl a few figure-eights through the batter, then sprinkle the top of the loaf with white and black sesame seeds and sugar. Bake for about 50-65 minutes, or until a tester comes out clean. Cool in the pan for 10 minutes, then gently lift the parchment sling to remove the cake from the pan and transfer to a wire rack to cool completely.